It just might be the Core's most troublesome class. Is anyone to blame? Hundreds of students enroll each year in one class in particular: Global Warming, a topics class that fulfills part of the physical sciences requirement. This is easily one of the most common routes taken through the Core. But there is a stigma haunting the class that, instead of introducing students to scientific “tools of inquiry” or raising “fundamental questions,” Global Warming is a waste of time and effort, and that, for most students, it serves the sole purpose of meeting graduation requirements. Douglas MacAyeal, who replaced Archer this quarter and has taught in the department for years, has brought with him his expertise in glaciology and a fresh outlook for the course. He has designed a new kind of labwork for the class that presents students with raw climate data, so they can draw conclusions themselves about climate change. The class is also specifically designed to help any student, regardless of academic background and interest, to grasp scientific concepts and to become capable, critical thinkers. “By sort of focusing on a very narrow question but looking at it really hard you get an overview of science in general,” said Archer. By getting an understanding of where the forecast of climate change comes from, he explains, they will be able to make educated decisions regarding a very relevant and significant topic. But in spite of all this, students continue to talk to their friends about how easy the class is, to boast about how they don’t have to attend lecture, and to complain that the class is a waste of their time. Part of the problem with the physical sciences Core requirement is that there are two tracks that students can take. One option, taken almost exclusively by science majors or pre-meds who need the courses anyway, is to take General Chemistry or Physics. The second option, for those who have no interest in taking these challenging and time-consuming classes, is to take topical classes, like Global Warming. For better or worse, this systematically divides students into two groups depending on the track they choose: those who want to take science classes, and those who are required to. And in the topical classes, there are more students who just don’t want to be there. This becomes problematic when the topical classes themselves are further divided into those students who are generally interested in the material—or at least are willing to give it a chance—and those who just want to pass the class so that they can cross it off their list of Core requirements. “I have noticed that my class seems to be broken in two populations,” explained MacAyeal. “One population is the population that I’ve never seen before that does not attend my lectures, that doesn’t talk to me. The other half is the students that I see in class. I recognize them and talk to them before class. They ask questions and are obviously engaged.” According to MacAyeal, 80 out of the 180 students are present at his lectures—on a good day. 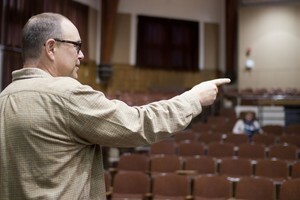 For Archer, normally only about half of the students enrolled in his class attend lecture regularly. Douglas MacAyeal, who is teaching Global Warming for the first time this quarter, has worked to make the material fresh and the class engaging. “Students make personal choices," he says, "and many of the students do not want to be in a physical science Core course.”. Those who do attend the class learn from the course and have fun with it in the process. As for students who miss class, their attendance is hardly necessary. Whether or not they learn from the class is practically irrelevant because attending lecture and engaging with the material is not necessarily imperative to passing the class or even receiving an A. The ability of students to pass the class with little to no effort stems partly from its reputation. Because of its notorious easiness, some students go into the class not expecting—and therefore not willing—to have to work very hard for their A. Considering that almost all of the students in the class are not science majors and are taking it solely to fulfill their Core requirement, it is not uncommon for students to feel this way, particularly when they are already overloaded with their other classes. “I think that was definitely reinforced by the fact that it’s a culture of ‘this class is easy’ so students who want to focus on their harder, more ‘worthwhile’ class might decide to sleep in and miss Global Warming so they can put more time and energy into harder classes,” explained Behrens. Archer, who puts extra effort into incorporating the more interesting aspects of science into his lectures, feels that he is doing everything he can. “I don’t think there’s anything I could do to force students to attend my class,” he said. Because of this, MacAyeal resorts to what he calls a sort of “devil’s pact” with those students who do not want to do the work. “They want an unstated pact where I will pass them with a high grade and not keep them out of law school, or business school, engineering, whatever. They will not complain about me and I will not complain about them,” he explained. In order to accommodate the staggering number of students who feel this way, MacAyeal accedes to this compromise, requiring that these students engage at the minimum level by having a “pass/fail for an A” policy on the labs. If they make it look like they did the work, they’ll get credit for it. Although this may be true for the students who attend class, or at least read his textbook or watch his recorded lectures online, high marks do not necessarily indicate understanding. Often, students get by with a little help from their friends. The fact that there is a new professor this year has not stopped students from trying to cheat. “I have a feeling that at one point one student came up to me and tried to hand in a homework assignment that was given last year by David Archer,” said MacAyeal. He hadn’t assigned the homework the student tried to hand in. The solution would seem to be simple: Make the class harder, or catch the people who cheat. But there are structural challenges inherent to the physical sciences division as a whole. Archer does not deny that smaller, discussion-based classes would likely help to engage students more, but he doesn’t know how it could be done. “There’s this theory about how lectures are bad and discussion is good, but it seems like the students need to be told what the material means and I need to do the lecture,” he said. Unfortunately, no one else seems to know what to do either, especially because of the limited available faculty in the sciences. Explains Stein: “Whether or not you believe that there are good reasons for that, it’s the norm of the field.” Science faculty at the University of Chicago, unlike faculty in other departments, are not required in their contract to teach Core classes, he says. If the University wants the best in the field, they can’t force professors to teach classes they don’t want to teach. This can be good and bad, he explained. Because the faculty who teach the Core classes are volunteers, they tend to be enthusiastic about instructing the class. On the other hand, not everyone volunteers. Because the faculty is so constrained, it’s almost impossible to offer smaller discussion-based classes that might do a better job of involving students intellectually in the material. This leaves few viable options for reforming Global Warming. One solution would be to instate a universal track for the physical sciences Core—all students, regardless of their major, would have to take some form of introductory science, such as General Chemistry or Physics 120. This way, all students would be subject to the same standards. However, professors question whether these standards would align with the ideals of the Core. Students also don’t see why they should take a rigorous class if it doesn’t directly pertain to their career path or their studies. “Why make students miserable?” asked Behrens. A second solution would place all students, including science majors, in a topical class. There are fears, however, that grouping non-majors and majors together in these courses would prevent science students from learning as much as they could on their own. “There is this point of view that, somehow, the ‘smart physics and chemistry students’ will be held back, and their lives will be ruined,” if they have to match pace with artists or economists, MacAyeal said. Dylan Lynch, a fourth-year chemistry major, shares the sentiment. “It would completely derail the majors, because you would add classes that are already much longer than political science or English.” He added that topical classes would be redundant, teaching science students basic material that they are already learning in their major classes. Although Kargman maintains that science students would likely provide a valuable example for other students, he recognized that majors might not reap similar benefits. As of now, no one is sure of how to remedy the Global Warming issue. Professors in the physical sciences, however, have recognized the issue and are taking positive steps toward a solution. MacAyeal shared an e-mail thread among teachers in response to a Maroon editorial last month, “A New Scientific Method,” which suggested the physical sciences Core requirement be entirely revamped. In the thread, members of the physical science division began the process of reassessing the physical sciences Core, proposing ideas for new classes, and discussing why students aren’t getting out of their Core science classes what they should be.